What are the latest trends in China's outbound M&As? How important is localization in the M&A process? At which step of M&A should a localization company be involved? Since the 'One Belt, One Road' Initiative, Chinese companies with global ambitions have been buying up overseas assets at an increasingly fast rate and 2016 was no exception, reported as the fastest on record. As JP Morgan pointed out, Chinese companies are looking to North America and Europe when considering potential mergers & acquisitions as the slowdown in domestic growth sends ripples across Asia and, more specifically, China's economy. This change is the result of a shift from an export-driven, manufacturing economy to one driven by technology, industrial know-how, and an increased consumption from a growing middle class. (JP Morgan, 2016) However, not all outbound M&As were as successful as predicted. Many of them failed to generate enough revenue and suffered from severe profit losses due to a number of reasons, such as an inability to adapt to foreign cultures. 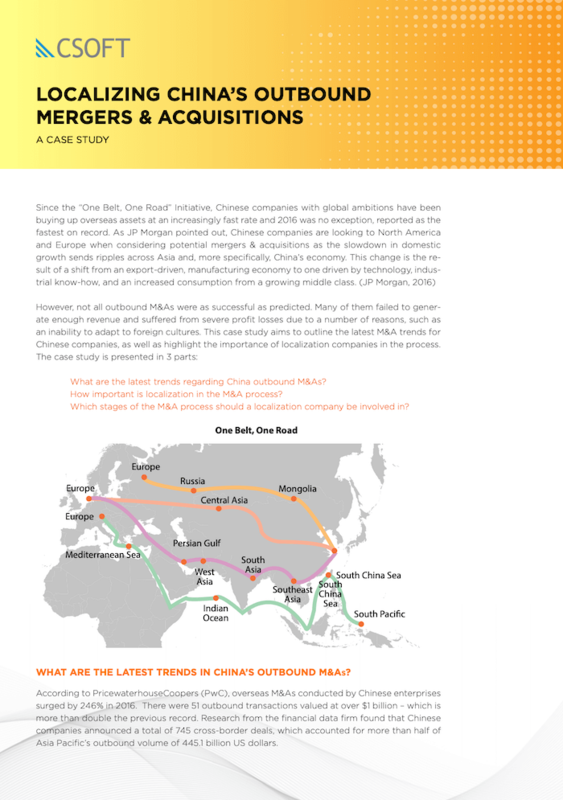 What are the latest trends regarding China outbound M&As? Which stages of the M&A process should a localization company be involved in?